Finally, here are some more photos from my trip to Madonna Inn nearly a month ago! Perfect timing for these pool shots since tomorrow is summer solstice. I don't usually care for neon colors but I love this bathing suit from Forever 21. The design of bright hues with irregular black lines reminds me of an abstract painting, not to mention the high waisted bottom totally did it for me! I accessorized with a light pink floppy hat also from Forever 21 and my incredible watermelon clutch by Nila Anthony! Happy summer!!! Neon abstract bikini top and bottom (sold out) c/o F21. Light pink floppy hat c/o F21. 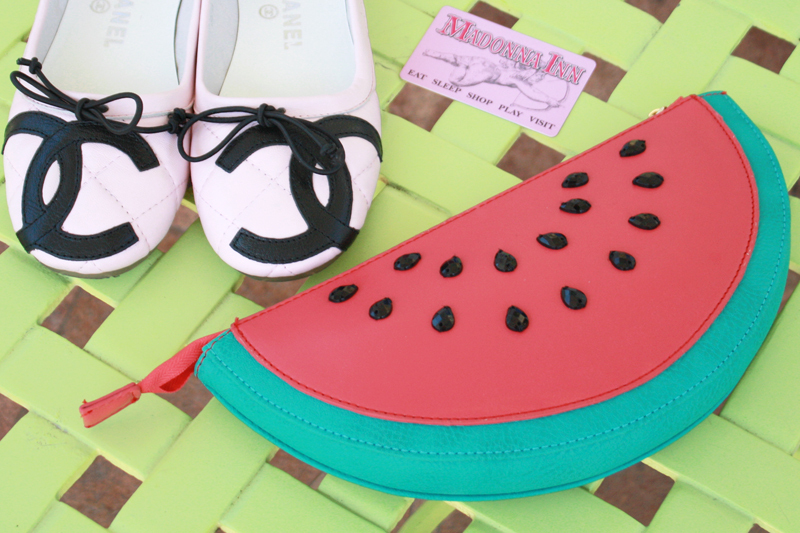 Watermelon clutch c/o Nila Anthony. Quilted ballet flats by Chanel. This is so, so cute! I love high waist bottoms. I'm not usually big on neon either (sadly, I'm more of a blacks, whites, and grays girl), but this is really cute! I should really peek at Forever 21's swim collection next year. Very nice bikini, so girly!